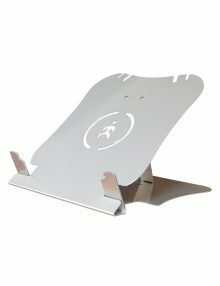 This adjustable laptop/tablet stand is made of high grade and light weight aluminium. It has a slim design which displays the device at seven different angles for viewing comfort. 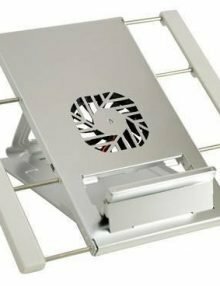 Comes with a built in cooling fan which is connected using the USB cable provided, to avoid an overheating problems. Carry case doubles as mouse pad. 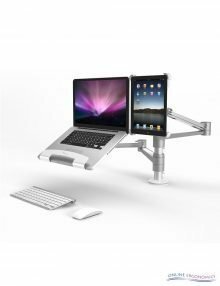 The Aero Evo Attachable Laptop Stand is designed for mobile working. 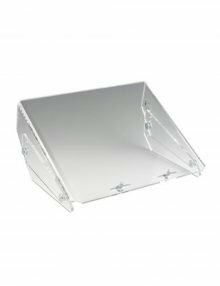 It connects discreetly to the base of any 12”-17” laptop and flips open for use in an instant. 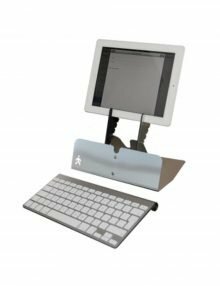 This ultra-light stand is held flat against the base of the laptop with magnets so it slips easily into a bag and the 5 height settings provide the correct and comfortable screen height for all users. 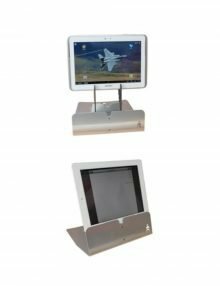 The Arrow tablet solution is suitable for all iPad models, Galaxy, Kindle Fire, and many other tablets up to 13mm in thickness. 5 angle settings from 54° to 75° and 2 Height settings. 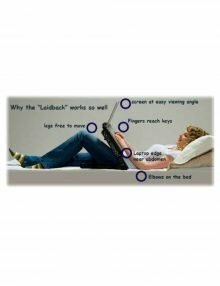 Laptop Laidback is specifically designed as a laptop table that provides the ultimate in comfort by providing full control and flexibility to place the laptop in the best position possible. 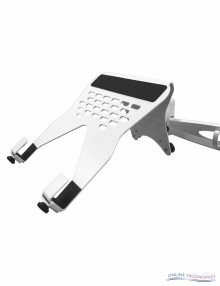 The advantage is that it positions your keyboard exactly where YOU need it accommodating your unique arm length, hand and body shape. 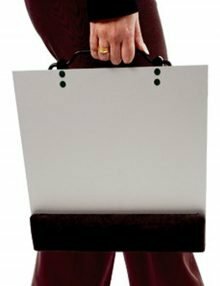 Weighs less than 3 lbs, very durable, easy to assemble, no tools needed. 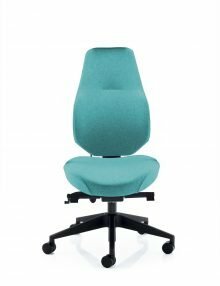 Adjusts to fit up to a 60” waist, Folds flat for easy transportation. 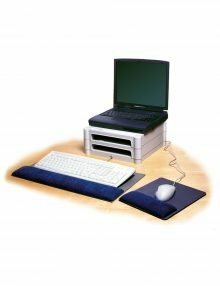 A laptop stand pack. Includes everything needed to get started. 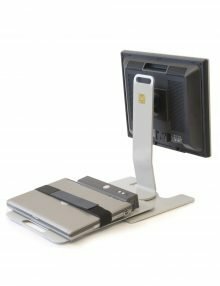 Simply place your laptop on top of the LeBloc monitor stands, plug in and turn on. 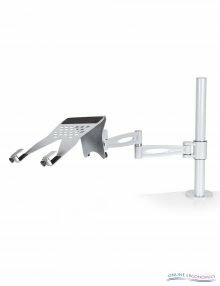 Put your laptop the same height as your monitors with Laptop stand for the R121 Single, R122 Dual and R123 Quad Monitor Arms. Comes in white or silver. Monitor Arm and Laptop not included. Raises the laptop to a more comfortable keying and viewing position. 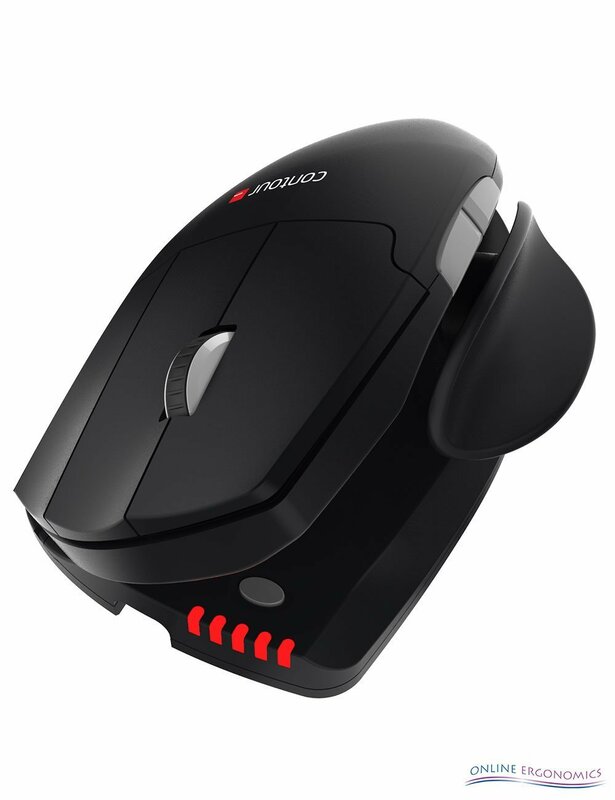 Raised wrist supports allows the wrist to sit in a more neutral position. 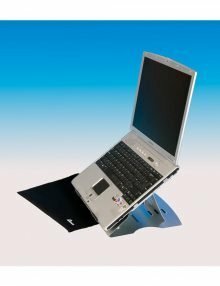 Ultra-light, fold flat laptop stand with 4 height settings. 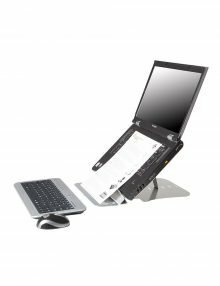 It also features an in-line copy holder, which holds reference documents in the perfect position to avoid neck strain. 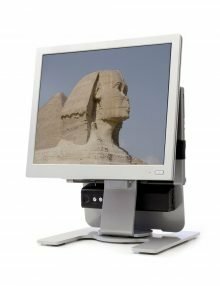 Sfinx Monitor stand has an integrated platform for a docking station to laptop computers, taking advantage of the same space as the normal monitor, while allowing vertical adjustment of your monitor to the desired level. 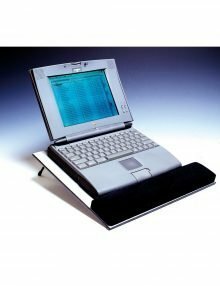 The laptop computer is quickly and easily docked to the docking station on the collapsible platform, which then is raised to the vertical position and the pivoting monitor stand is turn 180 degrees for immediate use. 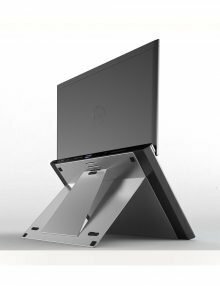 Aluminium Portable Laptop Stand with integrated swivel base for easy viewing angle adjustment. 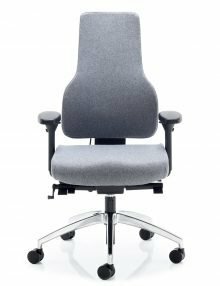 Ergonomic design constructed of aluminium material. 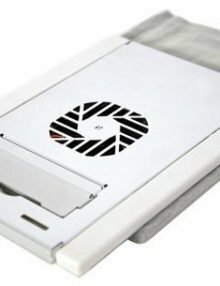 Rises laptop up to 16 cms (6.3”) offering laptop great dissipation Includes neoprene travel bag for transport and storage, also serves as a mouse pad. 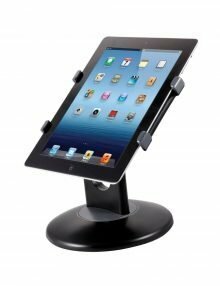 Provides easy handsfree access to your tablet. 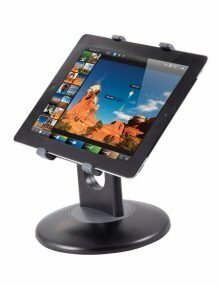 Rotate, angle and swivel your tablet for optimum viewing in Landscape or Portrait position. 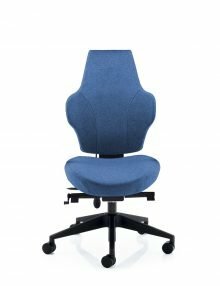 Weighted swivel base provides excellent support. Quick and easy to attach & remove tablet. Fits Apple iPad, Samsung Galaxy Tab, Toshiba Thrive, Motorola Xoom, Kindle Fire and more. The classic ‘U TOP’ laptop stand with new copy holder, and ‘quick lock’ support arms. Light weight less than 240Grams, and only 3mm thick! 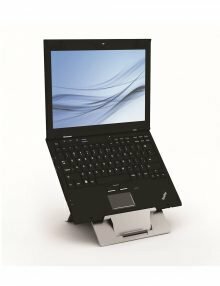 U-TOP PRO laptop stand with improved document holder and ‘quick lock’ support arms. 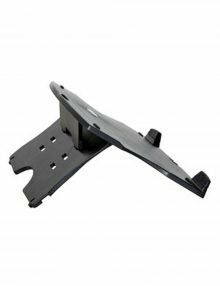 Viewlite Plus Laptop Holder is designed to add laptop holding capability to any of the Viewlite Plus monitor arms. 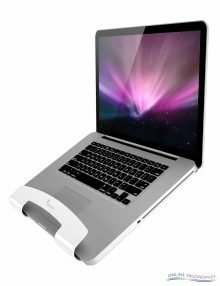 It gives a firm grip and is suitable for most laptops under 30mm thickness. It comes in both black and white. Laptop, Monitor, Tablets and Monitor Arms not included. Supports a max. thickness of 30 mm for an opened notebook.